Tonight I am very honoured to be asking Dylan Horrocks questions about his new book, Incomplete Works. 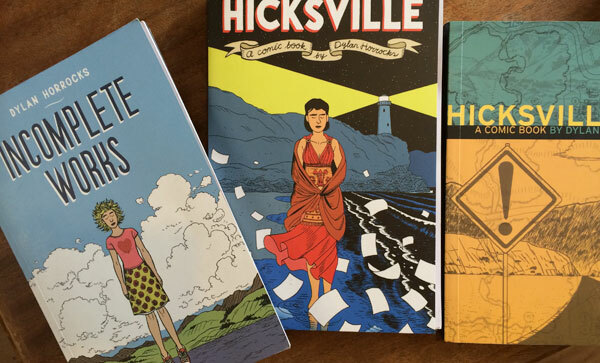 I’m a big fan of his, and last night I reread Hicksville and was blown away once again by how brilliant it was. Incomplete Works is a wonderful collection of short comics and fragments – in turn autobiographical, playful, funny, intelligent, moving – and always beautifully rendered. You can read a proper review here. Come along if you’re in Auckland – it kicks off at 6pm at the Central Library. There will be food, wine, and hopefully some good questions from the chair (better go finish writing them). Weird, I almost bought Incomplete Works at the UBS yesterday but then got misled by other titles – I will go back and get it RIGHT NOW.